This is the third module in the Simple Education Essential Guide to Coronary Angiography, Stenting and Structural Intervention course. 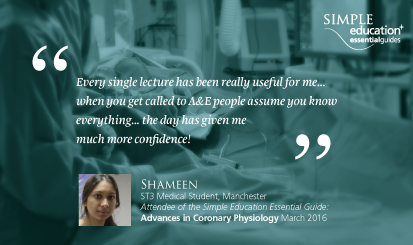 The one day course aims to provide you with the definitive guide to acute coronary syndromes, NSTEMI and STEMI. This 4 module series incorporates the BCS and BCIS curriculum and is aimed for general cardiology trainees, clinical fellows, physiologists, cath lab staff and Interventional Trainees. So, if you want to be more confident in the mangement of this increasingly common subset of patients - this is the course for you!